My sightseeing bus pass was still valid for today so I decided to do a different route and see where it took me. First off I went to the Mall next to my hotel to get some breakfast. I don’t think I’ll ever pay for breakfast again if I go travelling haha, I never seem to wake up in time to have it when I’m staying at hotels or hostels. My alarm goes off at like 9am and I’m so tired I end up just going back to sleep. I think I’m still on European time. So I missed the hotel breakfast and tried to find something at the mall. By this time it was like 12pm so I guess it was more like lunch. 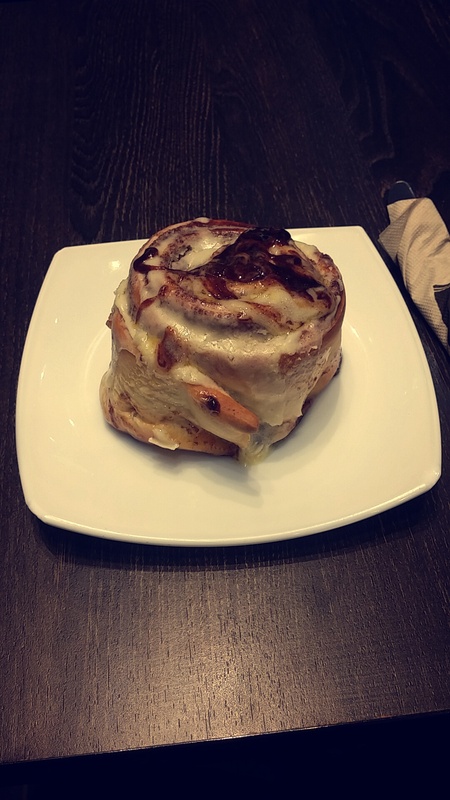 I wasn’t feeling like a big meal and I was on a budget so I got a cinnamon scroll! Hahaha. Probably not the best thing to start off my day. 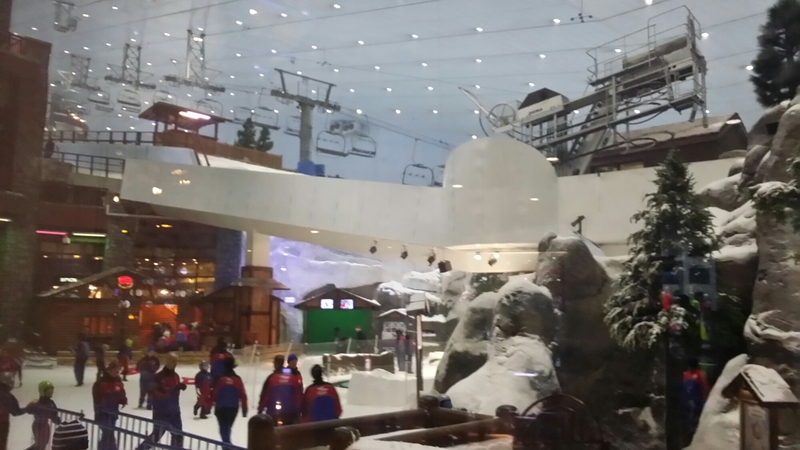 If anyone ever ends up going to Dubai, at The Mall Of The Emirates there’s something called Ski Dubai. Which is basically a large indoor ski field. 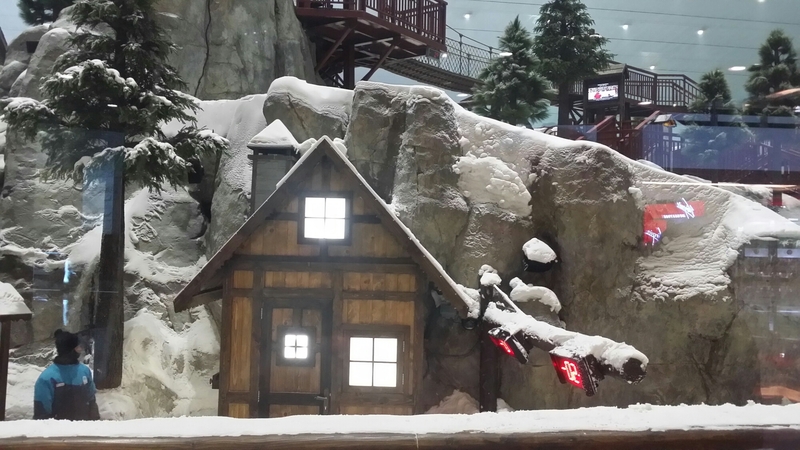 I never did it because I’ve done something similar before at Snow Planet In Auckland (and I’m not the best skier) but it’s looks like something fun to do in Dubai. 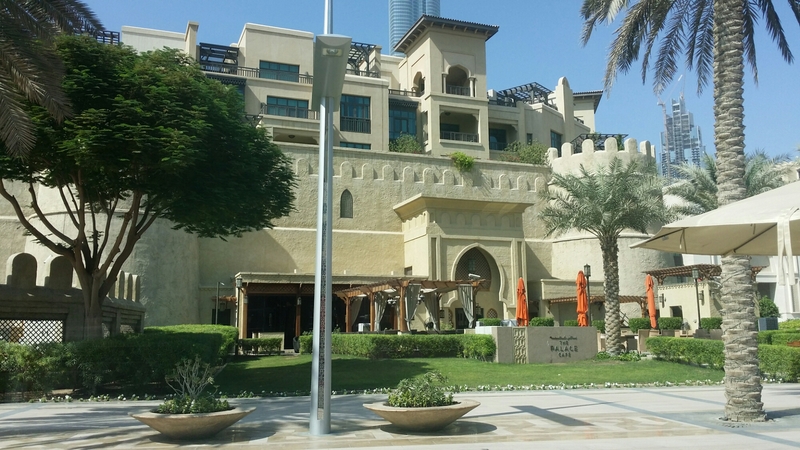 When I’d finished my ‘breakfast’ I went and waited for the next Sightseeing Tour Bus and hopped on to the one that would take me to The Mall Of Dubai. I had to switch buses there to get onto the Red route and had to wait about 10 minutes. While I was waiting though, this little baby kitten jumped out of the bushes and it just made me so sad! He was not a healthy kitten at all. He was so skinny and had yucky eyes but was so playful. He kept playing with the leaves and when me and this other girl started petting him he kept jumping up on us so we could hold him. Me and this other girl were worried how skinny he was, Ecspecially as he looked so young too! 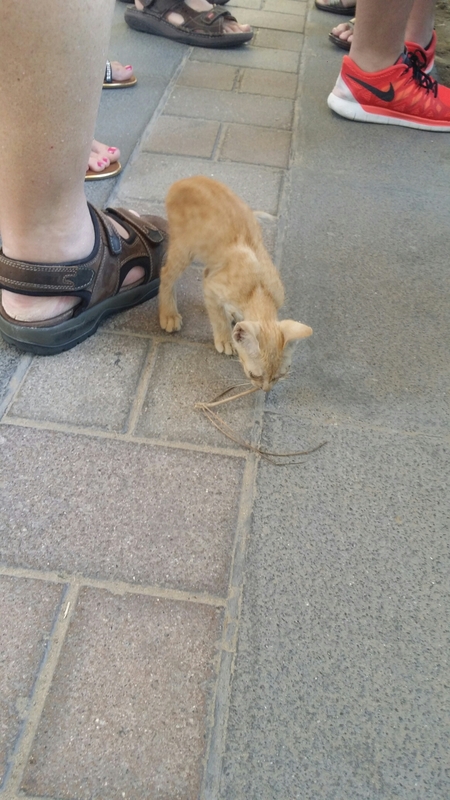 When our bus arrived the kitten kept following us and I had to walk away because there was nothing I could do. If I lived in Dubai it’d be such a different story. I’d take him to the vet and everything. The poor baby 😥 I seriously contemplated taking him back home with me but knew he’d be too sick to be allowed back. Awwwwww. 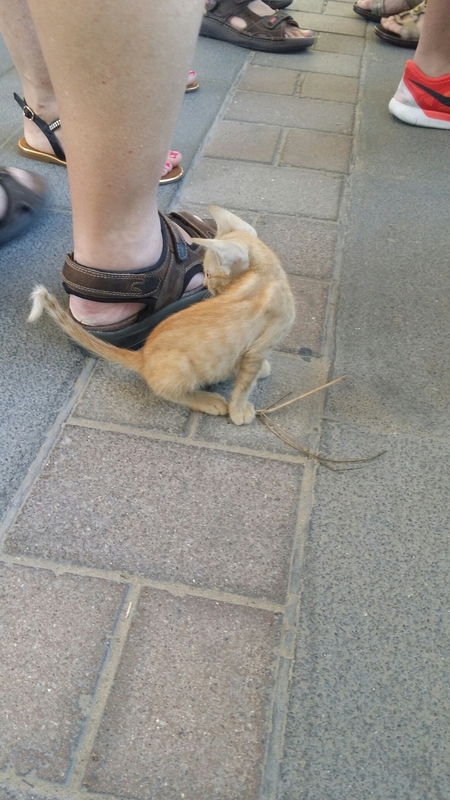 When we were about to pull away I saw him run under one of the buses so quickly knocked on the window to get one of the guides attention and motioned to him that the kitten was playing underneath the bus. Anyways, onto something a bit happier. 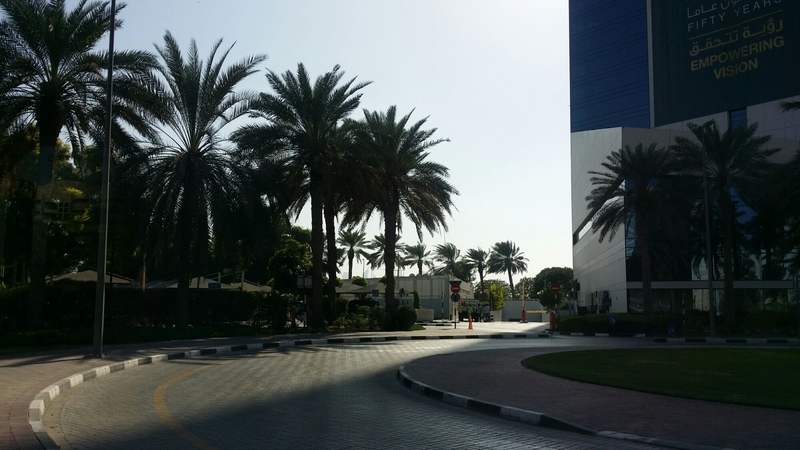 The red route took me past Down Town Boulevard which is where the Burj Khalifia, the Dubai Mall and the Dubai Fountain are all located. Apparently the whole area is 2 square kilometers so it’s pretty big. We also drove past the World Trade Centre which is along Sheik Zayed Road. It’s 39 stories and stands at 149 meters tall. Most of the floors are let out commercially and it used to be the tallest building in Dubai until they built the Burj Khalifia. 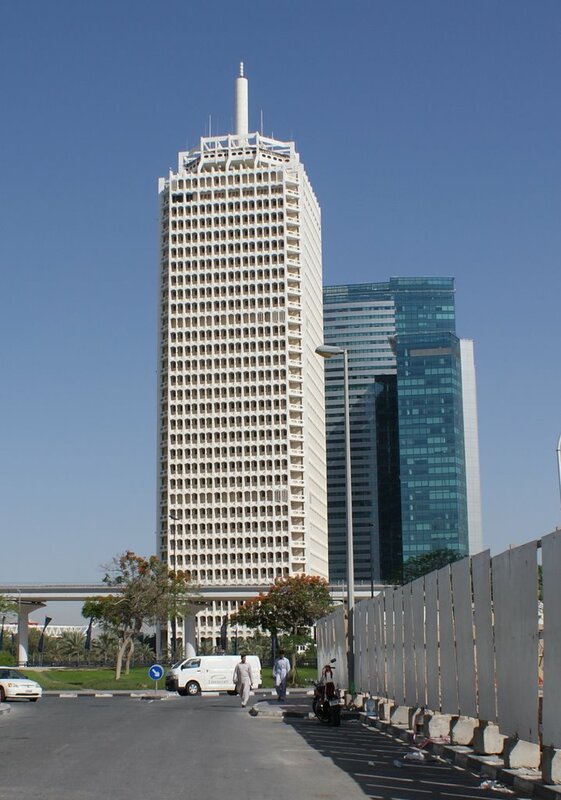 Companies like Johnson & Johnson, Mastercard and Sony are all in that building, it’s also featured on the 100 Dirham Bank note. 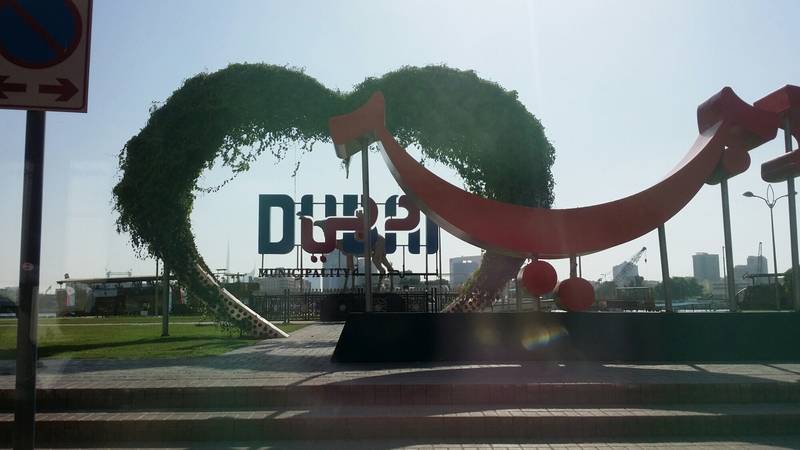 I got off at the next stop which was the Dubai Museum. All the information set out was quite interesting. 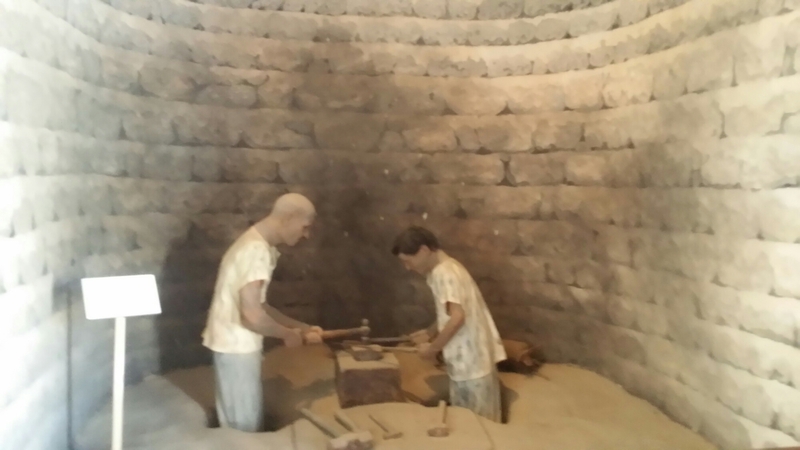 I read about how Dubai was sustained by fishing and pearl diving for a thousand years until the great depression hit which caused a collapse in the international pearl market. It wasn’t until 1966 that Dubai discovered oil which has pretty much made Dubai the modern, business centered city it is today. Dubai is also considered to be the ‘Hong Kong’ of The Middle East. I read that when the world’s oil supply runs out Dubai would happily survive as it was a major trading center before oil even existed. Lucky them! 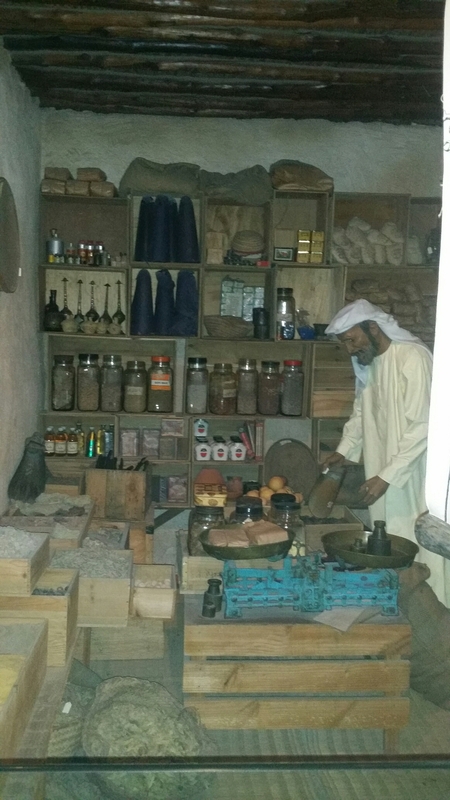 There was a part of the museum which spoke about food in Dubai from way back in the day until now. The Food in Dubai is very similar to that of India I’ve seen. It has lots of spices and most dishes contain rice, fish and meat because it’s so close to the sea it’s easier to get fresh fish that way. I also learnt that Camels milk is really good for kids as it’s high in calcium and fat. Not sure if I’d ever try that 😐 The meat is usually mutton from either sheep and goats as that’s what Bedouin kept. 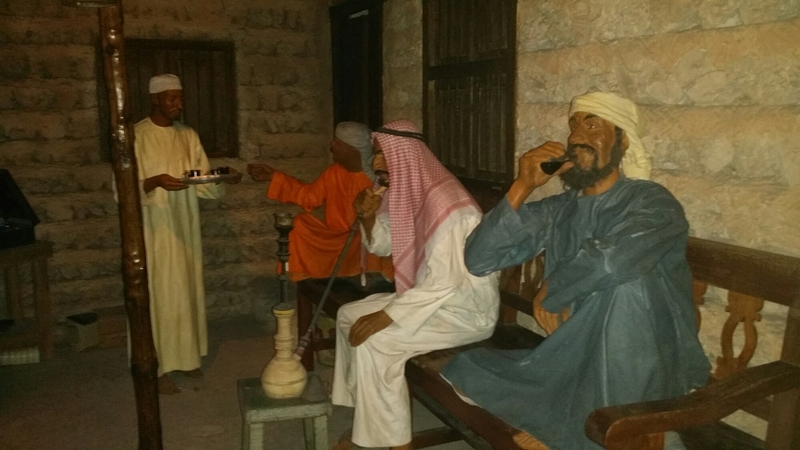 The Bedouin people are something to know about Dubai. They’re the people who inhabit the desert. It’d be so difficult to live in the desert but they’ve made it a way of life by adapting to everything and doing things a certain way. 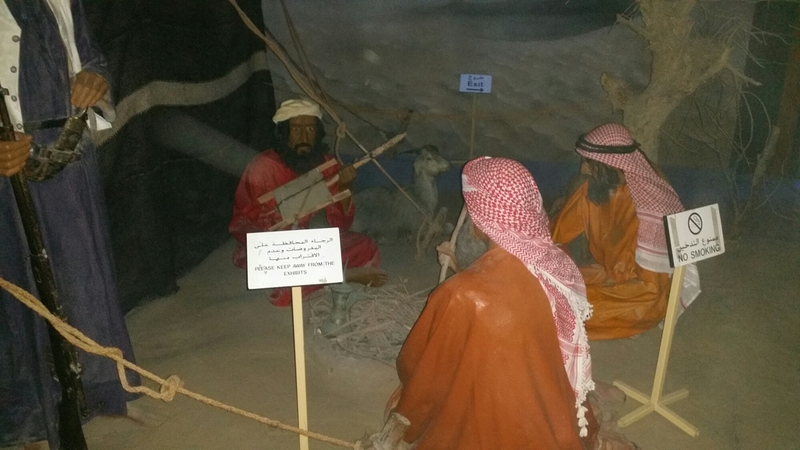 When you’re in Dubai you can also book an overnight stay at a Bedouin camp to experience a bit of how they live. The woman would take care of the house and the children and be in charge of collecting the water. They also drunk the camels milk which I mentioned before and made yoghurt out of it which the kids would help with. The families would usually stay in one place for 5 months and then move on to somewhere else like near the water so it was easier to collect something to drink in the Summer Time. Only few Bedouins live like they used to in their goat haired tents, raising livestock and hunting. Their numbers are decreasing and nowadays there are approx. 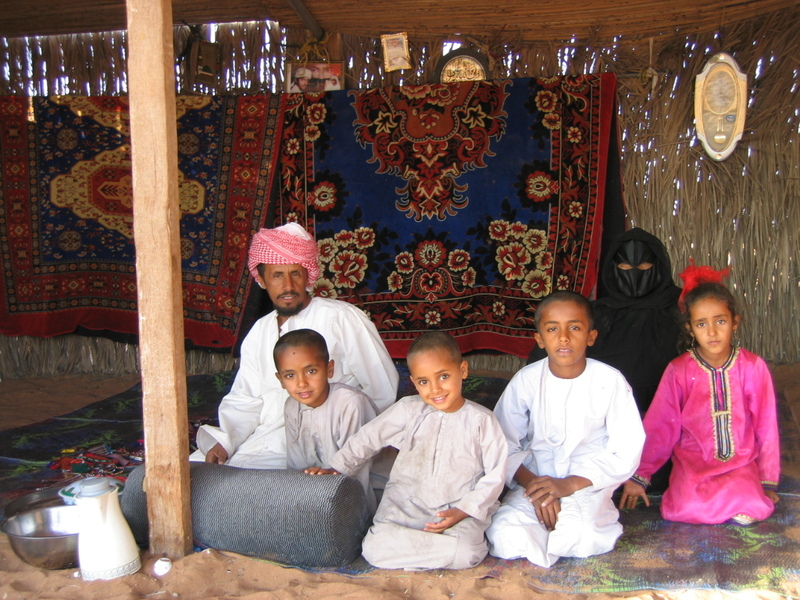 only 5% of Bedouins still living as pastoral nomads in all of the Middle East. You can tell if someone is a Bedouin as they have different facial features by which they can be distinguished from other Egyptians and also they generally dress differently. The Bedouin men wear long ‘djellabaya’ and a ‘smagg’ (red white draped headcover) or ‘aymemma’ (white headcover) or a white small headdress, sometimes held in place by an ‘agall’ (a black cord). I spent about just over an hour at the museum and then headed on my way to the bus. Luckily when I left I saw my bus company was there so I ran for it and made it on 🙂 no waiting in the sun for me! The bus took us to some more stops but I didn’t really get off. I was trying to time my day well so I could be back at my hotel by about 5pm. I was wanting to have a shower and then get ready to head out to a bar or something to watch the All Blacks play South Africa in the Rugby World Cup Semi Finals. We drove past a few Souks and as it was around 3.30pm I got off at a different shopping centre to have a look around and grab some lunch. I walked around Sephora for a little bit and contemplated buying some new mascara but they didn’t have the one I wanted in stock. 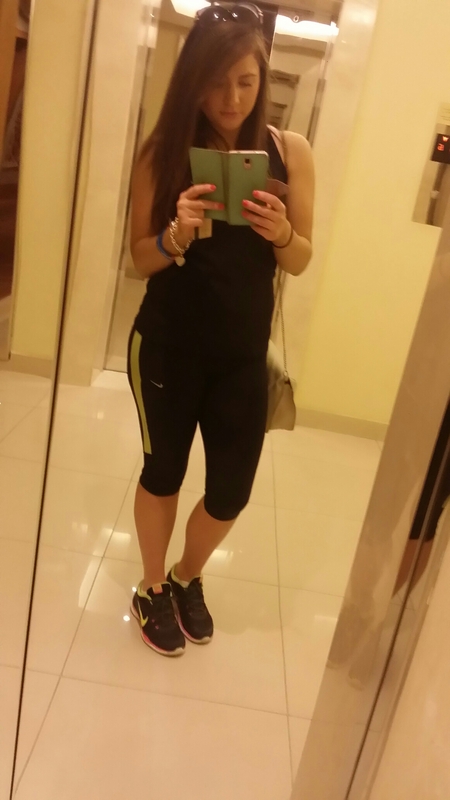 I ended up buying another pair of gym pants from some sporting store. The retail assistant was actually so annoying I don’t even know why I bought them off her. You find over here that in some stores (Victoria Secrets is so painful for this) the sales assistants follow you around like you’re about to run off with half of their merchandise. I’m usually just feeling the material or something as that’s what girls do. I try not to hover near an item for longer than 4 seconds otherwise it’s off the rack and in the changing room ready for me to try on. I love Victoria Secrets but every store I’ve been to on this trip, the girls in there are so helpful that it’s starting to do my head in a bit. But the way they write their name on a piece of paper for you and give it to you “incase you need help with anything” shows they must get some type of Commission for the items they sell you and don’t care if the pants your trying on makes you look fat. Next thing I know I have 5 bras I didn’t want, 3 tops and 2 pairs of leggings to try on. I ended up grabbing some fries from New York Fries later on as the pictures made them look yum, they were pretty average to be honest. 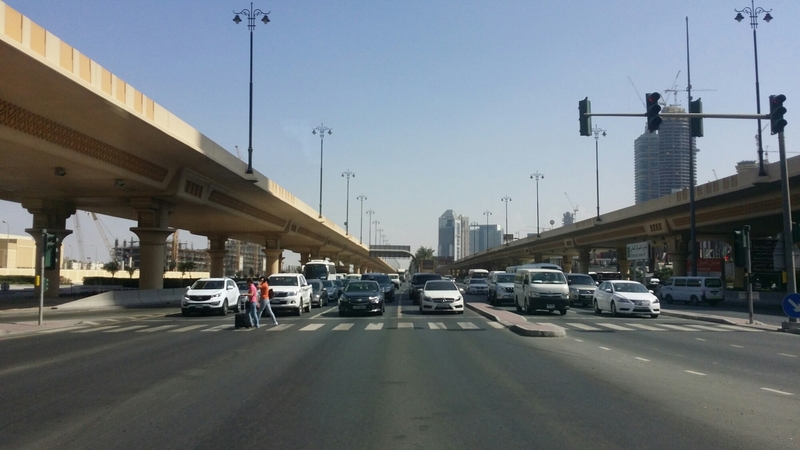 I mucked around too long that I got stuck in traffic on the way back to The Dubai Mall. To make a long story short, I got back to my hotel just after kick off so I didn’t get a chance to head to a bar or anything to be social with other kiwis. 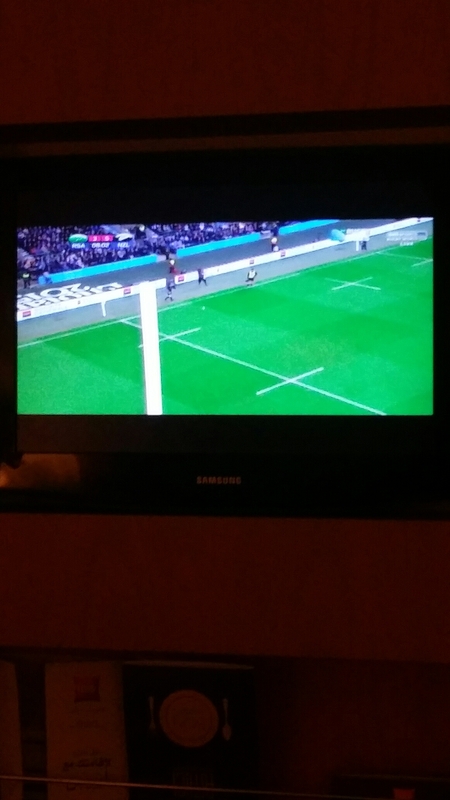 I sat on my bed in my hotel and watched a very intense game while really needing to shower from my sweaty day. Thankfully we won so we’re in the finals for the Rugby world cup 2015 against Australia. 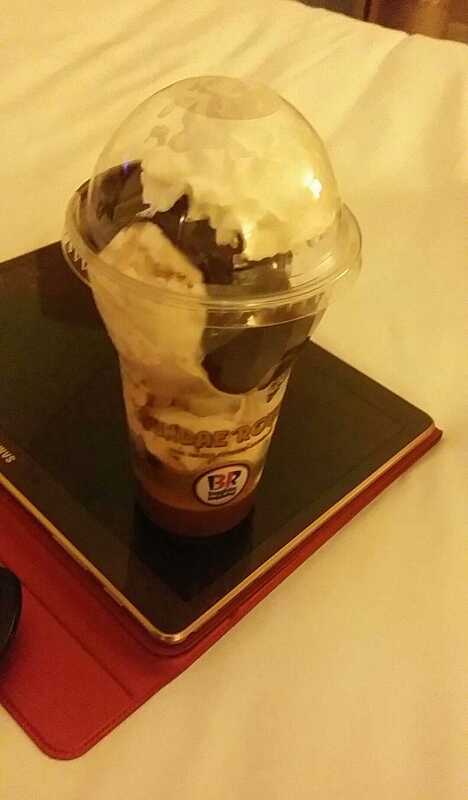 I did finish off my night with this lovely dessert though.